for free travel, apply today. Experience Jamaica's natural scenery with the best side trips Negril has to offer. All side trips can be purchased at orientation from our on-site reps. Ask on-site about Scuba Diving options. Great tunes, unlimited beer, rum punch, soda, snacks, and snorkeling equipment combine to make this Negril's most popular floating party! This cruise takes you along Negril's scenic cliffs for cliff jumping, snorkeling and swimming. Afterwards, the cruise continues along the cliffs for a perfect view of Negril's phenomenal sunset. Enjoy a ride through rural unspoiled Jamaica to Y's Falls. The scenic cascading waterfall offers climbing, swimming, an abundance of photo taking opportunities and the best rope swing in Jamaica! Transportation and admission to the falls are included with this tour. Take a daylong sailing excursion to Bloody Bay where you'll enjoy basking in the sun, snorkeling, and partying on your own private beach! Unlimited rum punch, beer, soda and a lunchtime snack make the island picnic a great value! Experience the adventure and excitement of rivertubing down the Great River. Chill out while the river winds down the mountainside to the ocean. An experienced tour guide will provide commentary pointing out rivers untouched beauty. The tour includes swimming and refreshments. This tour will show you the interior of Jamaica that can only be seen and reached by a 4x4 Jeep. Everyone rides in a 4 wheel drive Land Rover that takes you through the mountains, rivers and mangrove forest. There is a stop at a river where you hike up a series of natural pools and waterfalls. The tour stops at a The Blue Hole Property where lunch is awaiting on the seaside at the edge of the un-spoilt mangrove forest. Visit the famous Chukka Blue horseback riding trails. The ride departs from the Blue Hole Estate and passes the ruins of the Great House where the late Custos of Hanover entertained The Queen of England and The Duke of Edinburgh. The trail cuts through the lush mountains where visitors can enjoy a panoramic view of the coast. Your experienced trail guide will provide interesting commentary highlighting Jamaica's beauty,culture and unseen history. You will cross the Maggoty River and Maggoty Estate where you can view a Sugar and Rum factory from the 1700's. 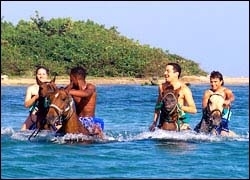 After a brief stop for refreshments you will be able to remount your horse and ride them in the Caribbean Sea!